Ever since I was little, I have been what some could call, a fussy eater. I prefer to think that I know what I like and I’m happy with that. However, as I’ve got older my refusal to try new things (flavours and textures) has softened and I’m more likely to try something new and something that previously I’d have refused on the basis that it was new and therefore I wouldn’t like it. Part of the reason for refusing new things was my absolute phobia of being sick. I was convinced that if I didn’t like something I’d be sick. ergo new food would result in vomiting. Safer that I didn’t tempt fate and stick to what I know. I’m fully aware that this rationale is ridiculous and the likelihood of this outcome would be very small but to a small child and then a truculent teenager, it seemed reasonable. This belief wasn’t limited to savoury food, sweet food was also viewed with the same suspicion if it was new or even vaguely unknown. Almonds were a pet hate. Ground, flaked, whole it didn’t matter – they were not to be trusted and should one find its way into my food, it was to be unceremoniously sought out and discarded. 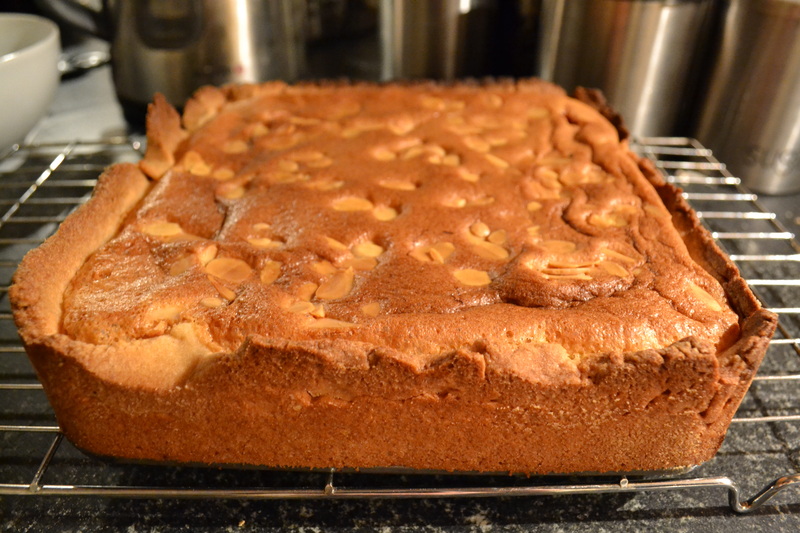 Marzipan was out, frangipane the same and as for muesli – forget it. Somehow, over the years, I’ve learnt to like almonds. Roasted almonds, smoked almonds and flaked almonds were good, ground almonds in brownies, korma and other things actively sought out. I don’t know what gave me the idea that I could eat them without being sick but clearly it worked and almonds were no longer on the list of things I would refuse to eat. Today was a “doing things” day; new glasses, new jeans and lunch in town. The first pit stop is usually a coffee shop for a pre-start caffeine kick and a bit of sugar. One of the favourite pieces of sweetness is the Costa Almond and Raspberry slice – sweet pastry, a layer of raspberry jam with frangipane on top dotted with more jam and flaked almonds. It’s served in small pieces on account of how sweet it is but ticks all the boxes in the pre-shopping requirements. Everytime I have a piece I tell myself I’ll try to make it at home – and finally I’ve carried out the plan. 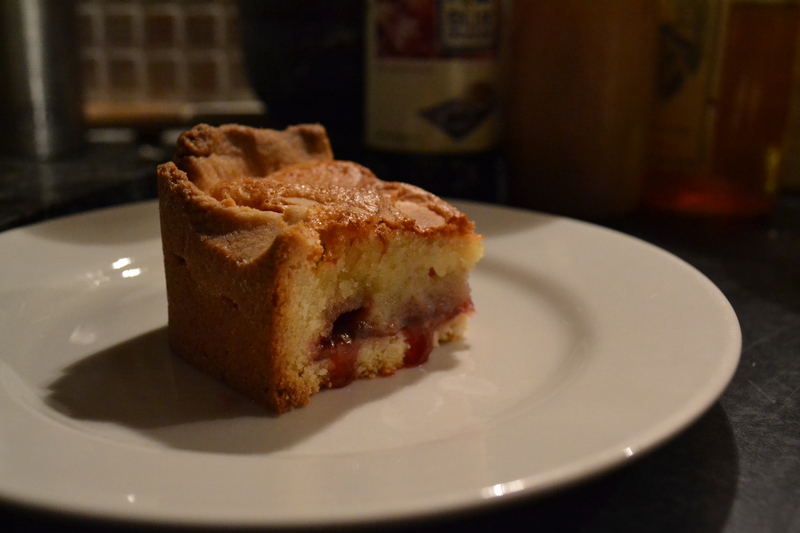 This is adapted from a recipe for a fresh raspberry and frangipane tart I found while looking for a recipe for frangipane – it’s currently cooling on the side after 45 minutes in the oven. It smells good and tastes delicious. The jam blobs have sunk and its still warm and oozy but well worth the premature slicing to get the pictures. Try it! First make the pastry. Rub the butter into the flour then stir in the sugar and a pinch of salt. Add the egg until the mixture comes together and you can combine to make a smooth ball of pastry. Wrap in cling film (Saran wrap in the US) and chill in the fridge for 30 mins until firm. I neglected this and it made the pastry much harder to work with. While the pastry is chilling, whisk the sugar and eggs together until pale, thick and creamy. The mixture should be the consistency of thick double cream. While the whisk is still running, pour the melted butter into the egg/sugar mixture and whisk until combined. Stir in the ground almonds until well combined and set aside. When the pastry is firm, roll out and then line a tart tin/spring form tin with the pastry – you’ll need at least a 3 inch side on the pastry to contain the frangipane mixture. Melt the jam until just smooth and spreadable and then pour and smooth over the pastry base. Do NOT prick the base – this is an all in one method. Pour the frangipane over the base, smooth over if needed and dot with more jam and sprinkle over as many flaked almonds as you like. Bake at 175C for 45 minutes – I baked for 40 minutes uncovered and then the last 5 covered with foil. When the frangipane is no longer wobbly but firm to the touch and risen, the tart is done. Remove from the oven and allow to cool before removing from the tin. Slice into small pieces and store in an air tight tin.